Cycling, undergraduate research, molecular biology, neuroscience, cancer, public health and Kenyon converged on a recent summer afternoon in a lecture hall at The Ohio State University Comprehensive Cancer Center – Arthur G. James Cancer Hospital and Richard J. Solove Research Institute (widely known as the James). Six Kenyon students gave presentations on their summer projects, all in collaboration with faculty and researchers at the James. Their work has been a part of the partnership between Kenyon and Pelotonia, the nonprofit organization committed to raising money to support cancer-fighting research at the James. Pelotonia is a three-day celebration that includes a 100-mile bike ride from Columbus to Gambier (and for the particularly hearty, from Gambier back to Columbus). Kenyon has hosted Pelotonia riders for four years, and during that time, many members of the Kenyon community have participated in this event as riders, volunteers and donors. I will be riding again this year; like many, I have family members and friends who have bravely battled cancer or are still in the fight. I ride in Pelotonia not only to support the cause to end cancer but also in tribute to their courage. Since its founding in 2008, Pelotonia has raised more than $92 million, and each dollar goes to cancer research. Kenyon students have participated directly in these research efforts, working on everything from mathematical modeling of gene expression in tumor cells associated with metastasizing spheroids, to genetically engineering mouse models to be used in identifying molecular targets for cancer therapies, to probing the relationships between socio-economic parameters and cancer frequencies. The fact that Kenyon students are active participants in such transformative research at a leading medical institute like the James fills me with pride. In this research work, students are given the tremendous opportunity to put concepts learned in their Kenyon classes into direct practice. They integrate ideas across disciplinary boundaries, combining techniques and approaches from biology, mathematics, chemistry, physics and computer science. And they hone their skills in problem solving, collaboration and communication. The presentations were terrific. And, on a personal note, the talks provided a great chance for me to “geek out” over updates on cutting-edge experimental work. In the Kenyon 2020 vision, we talk about the importance of providing “high-impact experiences” for all Kenyon students and developing partnerships between Kenyon and other institutions to expand the types of opportunities we can offer to students. These research experiences, and our partnership with the James through Pelotonia, are excellent examples of our efforts in these areas, and this program is an excellent model of what Kenyon can — and will — do as we move forward. For those of you in central Ohio, I hope that you can join us for Pelotonia here in Gambier Aug. 8, in downtown Columbus Aug. 7 at the kick-off or along the road cheering us on. 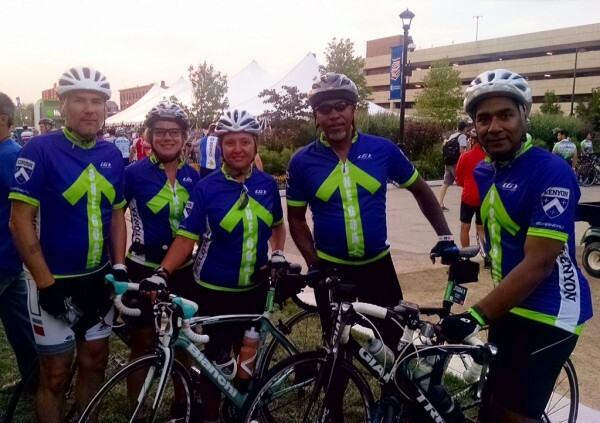 If you’re interested, you can volunteer for Pelotonia, and you can make donations recognizing the efforts of Kenyon riders.